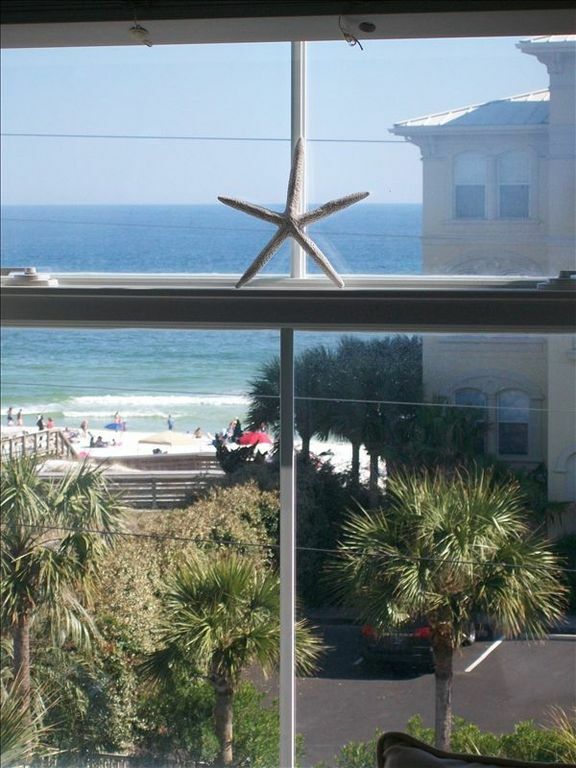 Panoramic Gulf Views, Steps to beach/30A, Top corner unit. Ahhh, La Mariposa (the butterfly) at the Inn at Gulf Place in Santa Rosa Beach, Florida, just a few miles from the precious beach communities of Seaside, Seagrove Beach, Grayton Beach, Rosemary Beach, Watercolor and more. Want some beach time? Just head down the path to the sugar white beach through one of three deeded beach accesses just 100 flip flops steps and you’re there. We provide you with two beach chairs or you can choose a Cabana rental. Don't forget your sunscreen!!! When you're ready to get your toes off the beach, head over to Sunset Coffee for Iced Java and a dessert (something chocolate, of course). Or meander through all of the charming shops at the Town Center. Check out local artists' wares at the outdoor kiosks full of fun local art. If cooking is your thing there are several groceries and fresh seafood markets nearby. Goatfeathers Seafood Market is just down the street....and there are lots of other activities on the property as well. Bike, kayak Stand-up boards (SUP's) rentals just steps outside the entrance to our elevator. In the middle of the town center is an outdoor amphitheater. The kids can play Frisbee or ball in the grass. In the summer the amphitheater is host to several concerts. And you can even go to church on the beach on Sunday at Ed Walline public beach complete with guitar music. If you’re feeling a little athletic, there’s shuffleboard, croquet, two tennis courts, walking trails, and biking. In fact there’s a walking/biking trail that parallels the entire 17 miles of Scenic 30A, and it is just outside our door! An official YOLO board (Stand-up Paddle boards) and bike rental shop is also right beside the entrance to our building. Rent some bikes and head out on and adventure. If Golf is your thing, Gulf place is located adjacent to The Santa Rosa Golf and Beach Club, with its newly renovated Tif Eagle greens. Golf Magazine called it 'The Purest Golf in the Panhandle'. The course winds its way down very close the the Gulf and Scenic 30A. It is also home to one of the few Gulf front dining restaurants, 'Vue'. It is all just a very short walk from our property. There are also some great eatery's right on the property, including La Playa Caribbean, Pizza by the Sea (voted best on the beach), The Perfect Pig Bistro and Preacher's (burgers,fries and such). There is even a locally owned 'Mom and Pop' Pharmacy. If you are looking for the ideal vacation spot where you can have the best of all worlds, activity and the hustle/bustle when you want them, but privacy, space and relaxation when you desire, then La Mariposa at Gulf Place is your dream vacation destination. Gulf Place is just the place for a great vacation. You have the beach and more - all within walking distance. You can't find a better place for a great vacation. Call or email us today for more information and to book your dream escape at one of the most highly acclaimed beaches in the US. Security Deposit is due at the time of reservation. Cancellations must be made 90 days prior to arrival for refund of deposit less the administration fee. If you book within 90 days of your arrival date, you will have two weeks from the time you make the reservation to cancel with a full refund of your deposit less the administration fee. If you cancel after final payment has been made and if we are able to re-rent the property, your rental fees and deposit will be refunded less the administration fee of $75. Refunds will not be given for late arrivals or early departures. If hurricanes or other extreme weather conditions occur the County Emergency Management Offices of North West Florida in conjunction with the National Weather Service may issue a mandatory evacuation notice. Only at that time, will refunds be pro-rated from the time of your departure. If no evacuation notice is issued by either of these government agencies and you choose to leave before the end of your reservation or to cancel because of the potential threatening weather, neither refund nor compensation will be made. Not Las Vegas, just better. Very laid back. We are located right along 30A , across from the beach. Wonderful Little Condo in a Great Area! Great location to beach and restaurants-all within walking distance. It was outdated and some areas on floor (bathroom especially) weren’t vey clean. Great location!! Views of beach are very good and you can hear the surf if doors are open. Very cozy and well equipped in kitchen and bath. Shops and restaurants in walking distance. Coffee shop downstairs was great. It felt like a secret hideaway. We will return again. We found the apartment to be super cute and perfect for a short stay. Comfortable bed, nice sheets and comforter. Very clean. Nicely decorated. Easy to access. We like the perfect pig restaurant. My only request would be they leave more toilet paper. For a short stay shouldn’t need to buy any. Loved the location, loved the view. Great condo!! The bed was super comfy, I think the large piece of furniture at the end of the bed makes it feel really tight in the room but I see your need storage. One thing I noticed in the bathroom is that the vent is clogged. Just observations, otherwise everything was great. We will definitely be back. Thank you!! - On property bike and Kayak rentals available.Numerous restaurants, coffee shop, clothing and artists shops on the property. There are also three pools, tennis, 17 miles of biking /jogging trails. We are located next to the Santa Rosa Beach Golf and country Club.